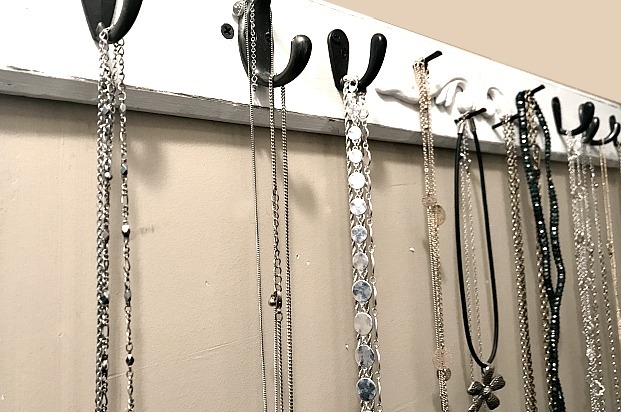 I had to get creative when it came to organizing my large collection of long necklaces. In the past I hung necklaces on pegs behind my dresser. I was forced to come up with a better idea. 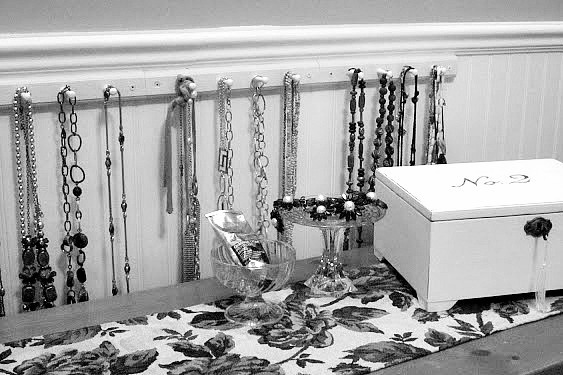 I decided on an easy and cost effective way to organize my jewelry without adding to the clutter. I repurposed a simple board with hooks and vintage nails. 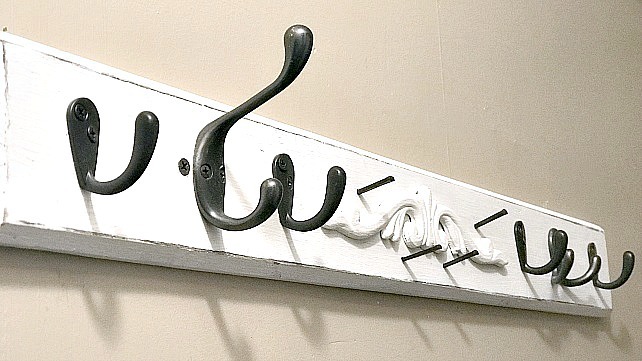 I hung up the hook rack on the wall in my walk in closet. It's a tiny little walk in closet so I had to make the most of every inch. 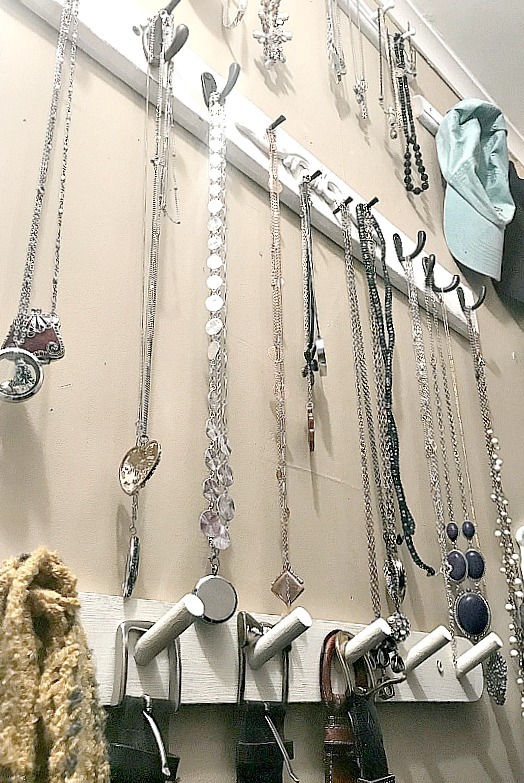 Opposite the clothes there is a big empty wall perfect for hanging my jewelry. Another peg rack below holds belts, scarves, and bags. On the very top a couple of smaller peg racks hold shorter necklaces and baseball caps. And yes, there is a small stool in the closet to reach the high racks. This inexpensive organization idea is working out great! 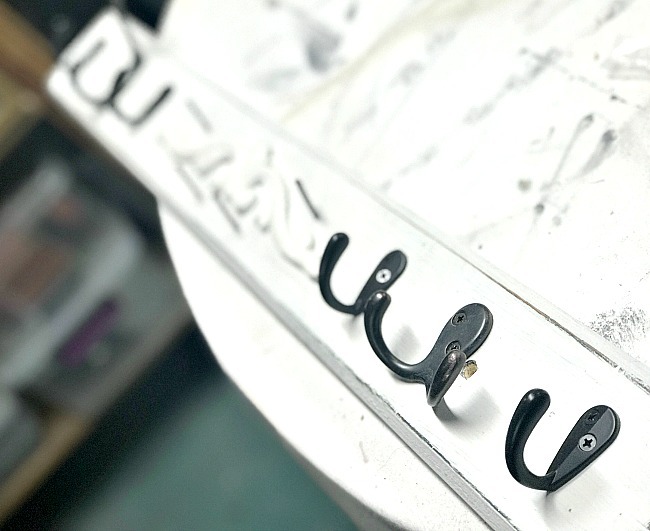 Everything is within reach and hanging the necklaces on hooks keeps them untangled! Hiding everything in the closet is an added bonus when trying to un-clutter my bedroom. This is my thrifty tip of the month and now please visit the rest of our team and see what they have cooked up for you! Such a great idea! I really need to organize my necklaces too. Love this repurpose! Thanks so much! I love the way it turned out and it works so well for me every morning when I get dressed for work! 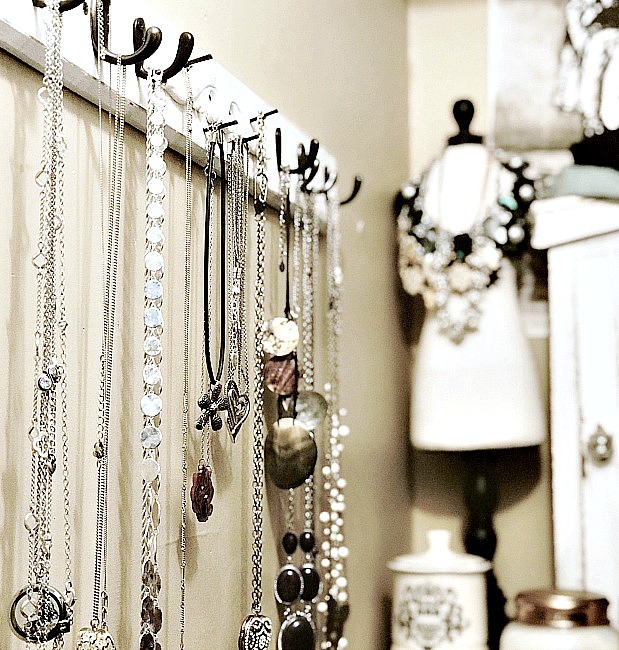 This is such a clever way to organize necklaces! I have so many that I don't even wear because they are all knotted up in my jewelry box. It works so well for me MaryBeth in the morning when I get ready for work! lol Cheryl it works so well! I love that I can see what I need when I get dressed in the morning! Such a great, simple organizing idea! 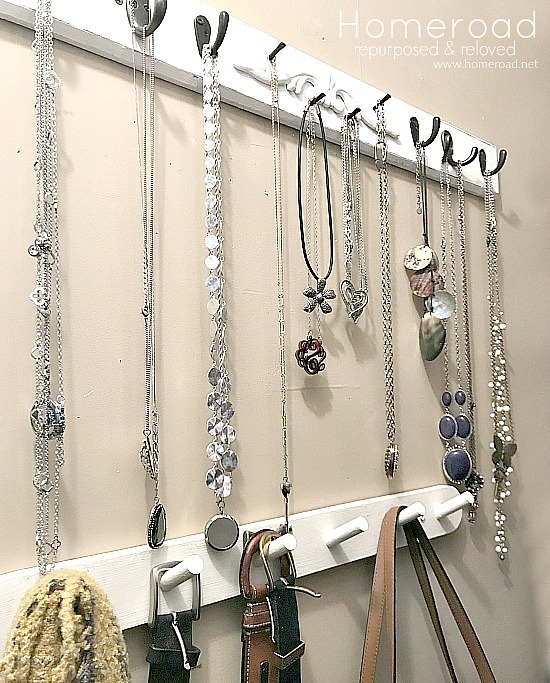 I've definitely been meaning to find a jewelry organizing solution too. I love that this one seems to have a lot of extra space in case your collection starts to grow by a few pieces! Mine is always growing Courtenay! I love long necklaces! I love this simple solution Susan! Very decorative too! Thanks so much Cindy! It keeps the room clean and uncluttered! Thank you so much, Susan! We are moving to a place that has a large walk-in closet and this is the perfect idea to use my space wisely. I just love visiting your blog and seeing all of your creative ideas. Meegan I'm so glad you can use this idea. It seriously is so easy to find what I'm looking for when I get dressed. It's right there when I pick out my outfit! Nothing worse then Jewelry all twisted up in one big knot. this is a wonderful solution to fix that. Thanks so much Kristi, it is such a simple idea that uses every inch of this small walk in closet! Haha I doubt it, your kitchen is way to clean and neat for that! Welcome to the Thrifty Style Team!